It's fine to follow directions of someone like me and install everything that is suggested, but how do you know for sure if you have been instructed to install the right products or that they are set up to protected your computer? By checking your computer's vulnerability with the following utilities you can see for yourself your computer's vulnerability and how to make any changes needed to secure your system. Shield's Up! When you click on this link you will be taken to a page that will explain to you what is about to happen. When you are finished reading and ready to see if your computer is vulnerable or not click on the Proceed button. 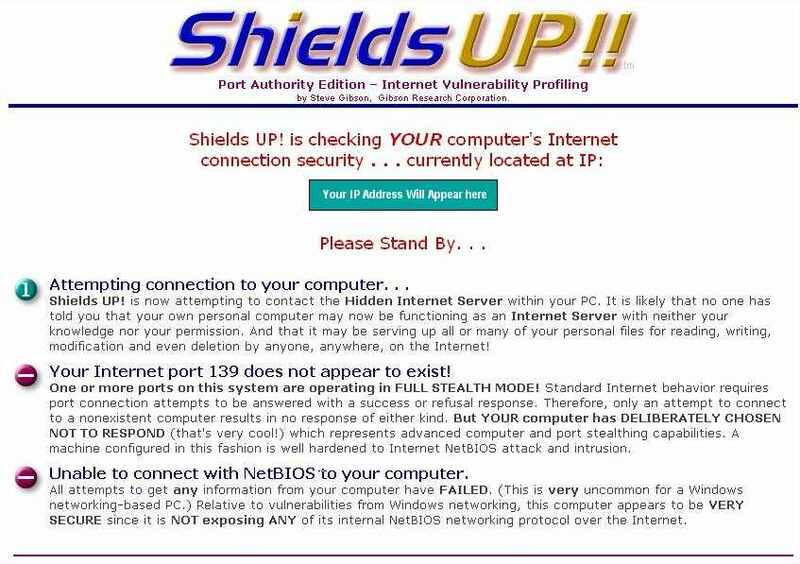 On the next page you will find a table called Shields Up!! Services. 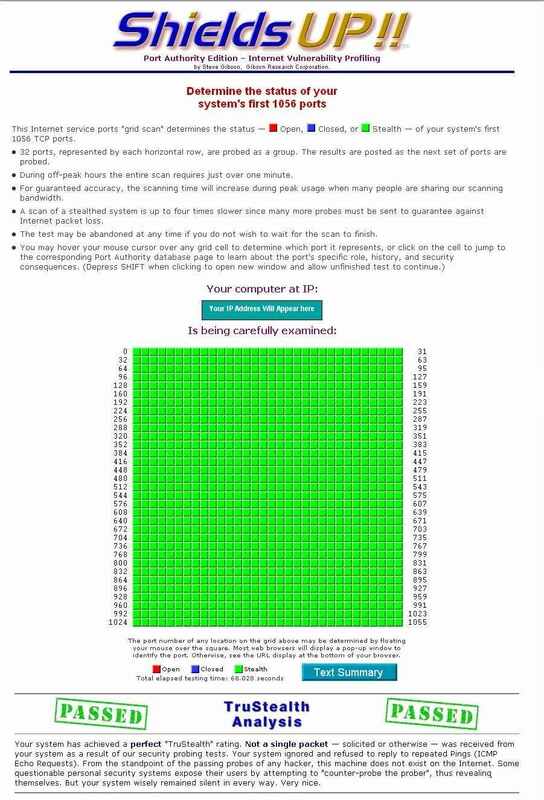 The average user will want to try the top row of tests. File Sharing, Common Ports, All Service Ports, Messenger Spam and Browser Headers will all test your computer and report back to you if your computer is vulnerable and how to make the changes to protect your computer. User Specified Custom Port Probe and Lookup Specific Port Information are for the advanced user. When you run the File Sharing test what you ultimately want to achieve is shown in this this screenshot. If someone attempting to access your computer cannot find any sign of life then they are not able to access it. When the Common Ports scan is run you want to achieve a full stealth report as shown in this screenshot. The utility will probe all of the common ports of your computer to see if it is able to access it. If it fails your will receive a TruStealth Analysis. The text version you should see is below. An All Service Ports Scan should also produce a TruStealth Analysis. Your report should appear as what is shown in this screenshot. As with the Common Port scan this utility will scan your ports, but a more intense scan is done by scanning the first 1056 ports on your system. Below is the text version of the report.